Do you have a favourite vineyard or producer from whom you would like to buy direct at their ex-cellar prices? And would you like to avoid paying the per bottle UK duty of £2.05 on still wine and £2.63 on sparkling wine (before 20% VAT on these sums)? But you haven't got the time to visit the vineyard to collect? You can order and pay for your wines directly from the vineyard and arrange to have them delivered to Boursot's Wine Collection in Ardres. You would be settling up directly with the producer, including any delivery charge to Ardres in the Nord Pas de Calais. We simply ask to be advised, at the time of ordering, of the details of the wines so that we can check them on arrival, as well as dates of proposed delivery and of your proposed collection so that we know whereabouts to put the cases in our cellars. Wines left in our cellars for more than one month would then incur storage charges. We charge 4,80€ per dozen bottles (or the equivalent in other sizes) for this handling service and this is payable when the order is being collected from Boursot’s Wine Collection. In addition to the Receiving Service above, you can utilise Boursot's Wine Storage Service in Ardres. 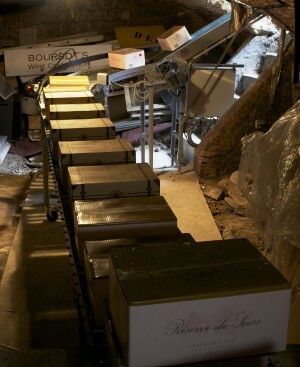 You can store your cases of wine in Boursot's secure underground cellars which have a constant temperature. Customers' own reserves are identified under customers' names and are insured against breakage or loss. There is no duty to pay when you collect your wines from our cellars and take them back to the UK for your personal enjoyment. Monthly charge 0,75€ (including TVA) per dozen bottles, or the equivalent in other sizes.